Today marked the opening of the brand new Harambe Market in the Africa section of Animal Kingdom. This new area serves many purposes. First, it has several counter service eateries with African inspired food. Also, there is a large seating area with tables and chairs. Finally, it serves as a cut-through between the exit of Kilimanjaro Safaris to the walkway to Asia. It will relieve the congestion that is typically found on the main drag through Africa. 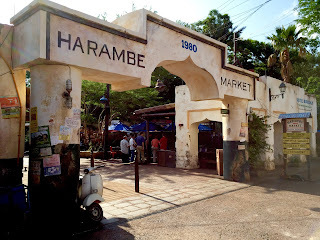 My son and I were the first guests to arrive at Harambe Market this morning, and I was able to take many pictures before the crowds showed up.